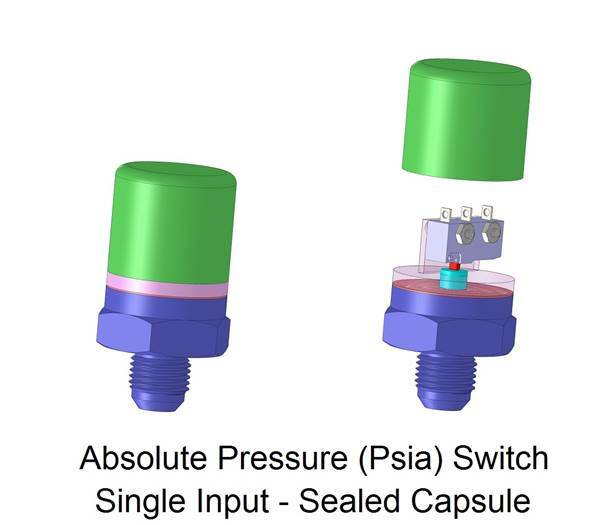 Kearflex incorporates our diaphragms and capsule assemblies into absolute pressure (Psia) switches. 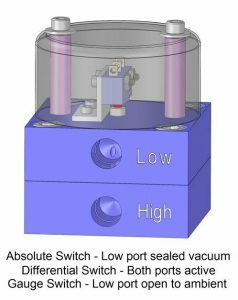 In the absolute switch, the sensing element has a permanent vacuum trapped inside to allow the switch to respond to atmospheric pressure. Kearflex integrates our diaphragms and capsule assemblies into absolute pressure (Psia) switches. In the absolute switch, the sensing element has a permanent vacuum trapped inside that provides a reference for the measurement. Applications include vacuum systems, and monitoring sealed tanks such as fuel, water, or waste. Kearflex designs our diaphragms and capsule assemblies into differential pressure (Psid) switches. 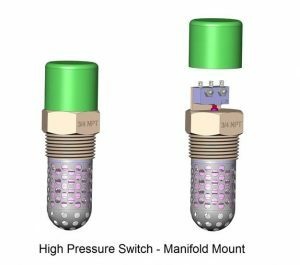 In the differential switch, the process applies pressure to both sides of the diaphragm allowing measurement of closed systems. Applications include zone pressurization systems, air filter pressure drop monitoring, vapor recovery systems, and closed tank level monitoring. Kearflex incorporates our diaphragms and capsule assemblies into gauge pressure (Psig) switches. In the gauge switch, the process applies pressure to one side of the diaphragm, and the other side is open to ambient. Applications include pump output, vented tank level, and general process monitoring. Often used as a failsafe on engine oil pressure or tank overfill protection. Kearflex integrates our diaphragms and capsule assemblies into temperature switches. 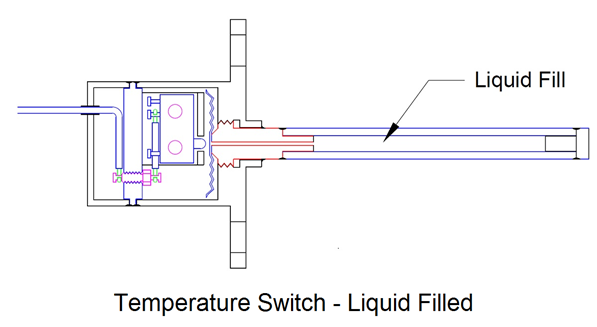 In the temperature switch, a trapped fluid applies pressure to one side, and the other side is open to ambient. The fill fluid had known vapor pressures with respect to temperature. Applications include lubricating oil, tank monitoring, and general process monitoring. Often uses as a failsafe to critical temperature controled applications. Kearflex utilizes a unique capsule assembly into our high pressure switches. These switches can be calibrated in ranges from 1,000 Psi to 5,000 Psi, and are compatible with hydraulic and cryogenic fluid. Applications include lubricating oil, brake and other hydraulic systems, and cryogenic fuel measurement. These complex assemblies can be provided on a build to specification basis, but it is usually more practical to reverse engineer the product, and adapt the design to known and active Kearflex practices and processes. This is applicable to end of life situations where internal or external vendors have ceased to exist, or abandoned the products. It is very common for there to be references to unavailable or inapplicable documents such as proprietary process instructions, obsolete engineering specifications, and vendor specific test equipment procedures. The design can be converted to use existing Kearflex processes for welding, brazing, soldering, and external processes such as plating, and anodizing. A good portion of the designs can be considered by similarity, as these adaptations are based upon flight qualified practices that are in active and continuous use with similar products. It is worth noting that the legacy products of this type were all designed around the same time and used similar practices that differed with the particular manufacturer. The conversion to Kearflex practices represents a low design risk, and a great deal of similarity to the original products.